LiNC80 SBC1 kits are available for purchase! 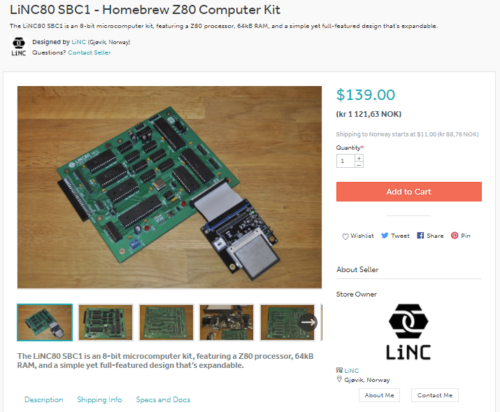 I am proud to announce that as of now, my LiNC80 SBC1 is available for purchase in kit form at Tindie! It took me a few tries to get through the approval process, simply because the fairly high differences in the fairly high shipping costs incurred from using Posten Norge as my trusted carrier, forced me to make separate listings of Kit and PCB, and that caused issues, as Tindie weren't used to dealing with that. I'm not sure if this is the culmination of or the start of a lot of hard work. Now starts the bit where I need to ship, restock, support and see what people make of it. But first of course the terrifying bit: will anyone actually purchase the kit? If you want a compact, expandable, fun 8-bit retro computer reminiscent of 1979, head on over to my Tindie shop now! 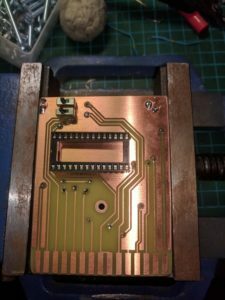 I mentioned in my previous post about the possibility for a ROM Monitor getting a port to my homebrew system. Yesterday, I received a mail, containing ASM-files and a compiled HEX file of the first attempt at a port. Even without access to hardware, Steve has been able to make a working version of SCMonitor for my system! It's still early, and uses RC2014/G.Searle style clocking of serial ports, but it boots and works! Here's an update to those who are following my "homebrew" tag to see if I actually end up making kits available. I'm most definitely working to get kits of this microcomputer available. I have updated my company page over at linc.no/products, and that will be the "home" of the product side of things. I'm planning on selling the kits though Tindie when I get them, well, kitted up. I've received permission from Grant Searle to include his software on ROM in the kits, and also his permission to make available changed code for the parts where I need to make changes. Getting his permission really made me happy. I've also been talking with Steve Cousins about the possibility of a future port of his Small Computer Monitor (SCMonitor), and we are both enthusiastic about that (scmonitor will not be included in kits, at least not at launch). The base set of passive components, and the "jellybean parts" have all been ordered, or I already have them in stock. I've also done quite a bit of evaluations on materials needed for handling/packing/shipping, and there's a bunch of bags and boxes on their way to me currently. I had hoped to have the kits available already, to be honest. Unfortunately that's obviously not the case. Brushing aside delays caused by funding, I've decided I need to halt the progress a bit. On the C-revision of the PCB, I have discovered that using only one Serial Port with the other not connected causes usability issues. When using SIOA, with nothing connected to SIOB, it's nearly impossible to get the computer to recognize the SPACE press needed at boot to select console. Also, when using only SIOB with nothing at SIOA, there's a case of character injection. Both of these are solved by simply adding two resistors on SIOA: a 470k pull-down on CTS, and a 470k pull-up on RX. I think the "I can't boot the computer" issue when using only SIOA is critical enough that I need to make a new revision of the PCB. This gives the option of fixing a few silk-screen errors, and adding a non-critical jumper to the board. Before ordering new PCB's with the mentioned changes, I really want someone else besides me to actually try to build the kit. To get that accomplished, I've enlisted the help of a few friends who gets a kit each to build. Because I won't order new PCB's before I've had their feedback, I can't start making kits available before two weeks after they have built theirs. Unless something else shows up along the way, I'm counting one week to get the "beta kits" out, two weeks for the "beta builders" to get their kits assembled, and another two weeks of assessments and finalization. That puts my "ready" date at the absolute end of April. 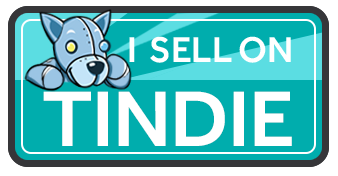 So if all goes according to plan, I should be able to have kits listed for sale with Tindie in the first week of may, with first possible deliveries the week after. I have for some reason still not received any questions about prices, but I'll give an estimate. Looking over my numbers at the moment, it seems I need to charge somewhere close to US $160 for a kit, shipping not included. This is a rough number, and is likely to go down some, but not much. Currently mu shipping options is to use the Norwegian Post. They are quite expensive, but at least they are predictable: international letter (untracked) is ~US$18 flat rate, while tracked parcel is a whopping $49. EU addresses save a few € on each of those prices. While testing my homebrew computer, I made some home-made addons, both in form of perf-board construction and home-etched PCB. I actually also made a connector-on-cable adapter, where I soldered the individual lines of a 30-pin ribbon cable onto an 805-series card-edge connector on one end, and because I failed to properly crimp an IDC connector on the other, I ended up soldering all 30 pins on that side as well. 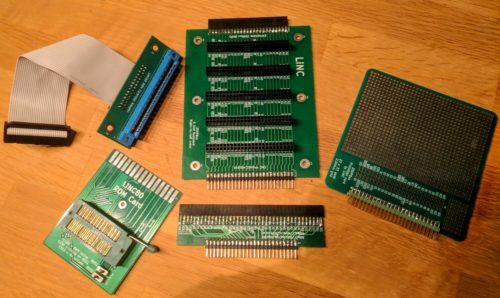 The other home-made adapters I made were: parallel input tester (perf), parallel output tester (perf), adapter from Z50Bus to RC2014 backplane (perf) and ROM Cartridge (PCB). 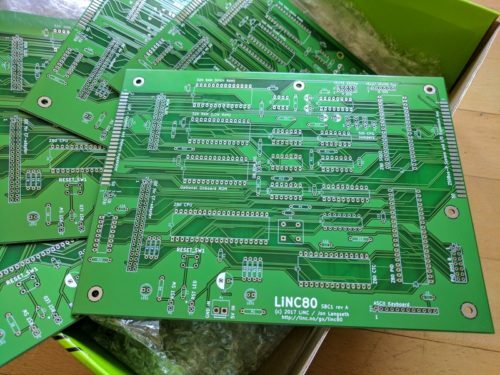 Considering how good the PCBs I got manufactured for the LiNC80 SBC1 itself, and how much effort went into making the Z50Bus-RC2014 adapter, I decided I wanted to get manufactured a set of support cards for the machine, and make it all look just as good. Additionally, having these support cards available would mean that I could have a small «ecosystem» of parts for future kit availability. 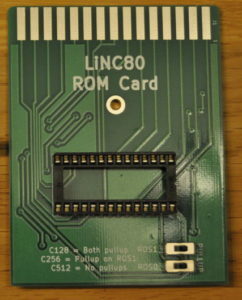 The first card I designed was the ROM Cartridge PCB. The design I sent to manufacture for that was simply a slight tweak of the design I had already etched for testing, so it made sense to complete that first. The card is designed to be large enough to comfortably insert and remove. It has a 28pin location for either a direct soldered or socketed ROM chip, and a central mounting hole for encased cartridges. 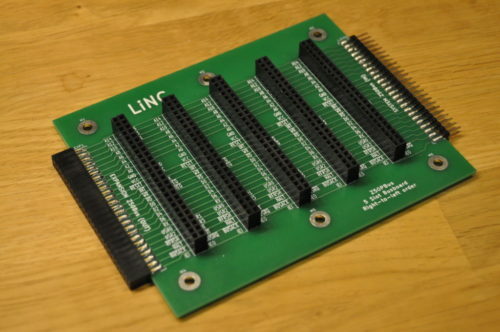 The two two-position jumper locations allow for any ROM chip size between 16 and 64kByte, taking advantage of the LiNC80 ROM Bank select signals for ROM sizes above 16kByte. 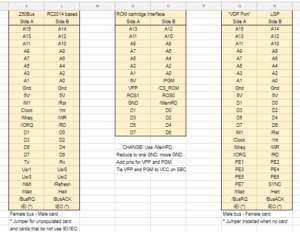 If the intended ROM application fits in a 4k or 8k chip, it’s naturally no problem to use chips of those sizes, as the pinout on the connector is JEDEC compliant. Two jumpers are also on the board, making the choice of ROM chip size flexibility possible, and at the same time giving access to (and control over) the ROM bank select signals on my rom slot connector. As I mentioned, I hand-soldered ribbon cable onto connectors to test the ROM Slot functionality of my design. Anyone who has tried soldering ribbon cable knows how much pain that is. To anyone who has not tried: avoid it if you can. So to spare anyone else from the unpleasant soldering task, I made up a simple passive IDC-to-Cardedge adapter. This is a purely passive adapter, with a pin-for-pin connection for all 30 pins. 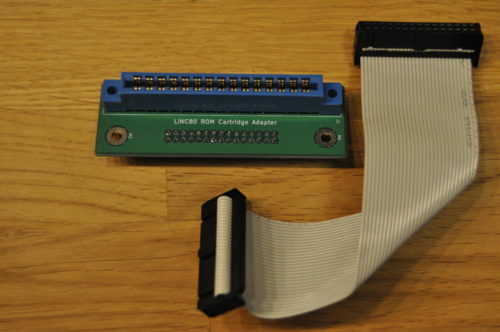 This means it can also be used as a general pinheader/IDC-to-cardedge adapter in addition to its intended use. When I first started my design, and came up with the Z50Bus, I realized that I would have to make some kind of bus back-plane card. For this first iteration/version, I decided to make a purely passive one, without any bus buffering built in. I didn't even provide locations for decoupling capacitors, leaving the responsibility for those kinds of things to the expansion cards. The back-plane has 5 standard slots. Connection to my computer on the right-hand side because the expansion connector on that board is on the left... On the left hand side of the back-plane is an extension header, meaning in theory, multiple cards can be added in a chain. Speaking of chains. The Interrupt Chain signals IEI/IEO on this card are connected in a right-to-left order. This makes the first slot be on the right-hand side of the card, closest to the Z50Bus host. With a back-plane available, it would be nice to have some compatible expansions. Unfortunately, I hadn't made any of those yet. And I had quite early on realized that my choice of dual-row headers for the bus made prototyping more difficult than if i had gone for single-row. The natural step from this, was to make a made-to-fit prototyping perf-board! My board provides a main prototyping area of 27 by 37 individual pads on a standard 2.54mm grid, plus an additional grid of 9 by 5 pads. The 50-pin bus connector is broken out on easily accessible connection points, providing two connecting pads per signal. I chose to make the board exactly 100x100mm. The real reason for this size is that most DIY-friendly board manufacturers have especially low prices for boards up to (including) just that size. Because I already had built an RC2014 kit, as well as a couple of addons for that system, I felt it made sense to be able to test my expansion bus using those. i had after all designed the bus to be relatively compatible. During building and testing, I created a perf-board version of an adapter, with pin-to-pin wiring. This worked, but it was fragile. 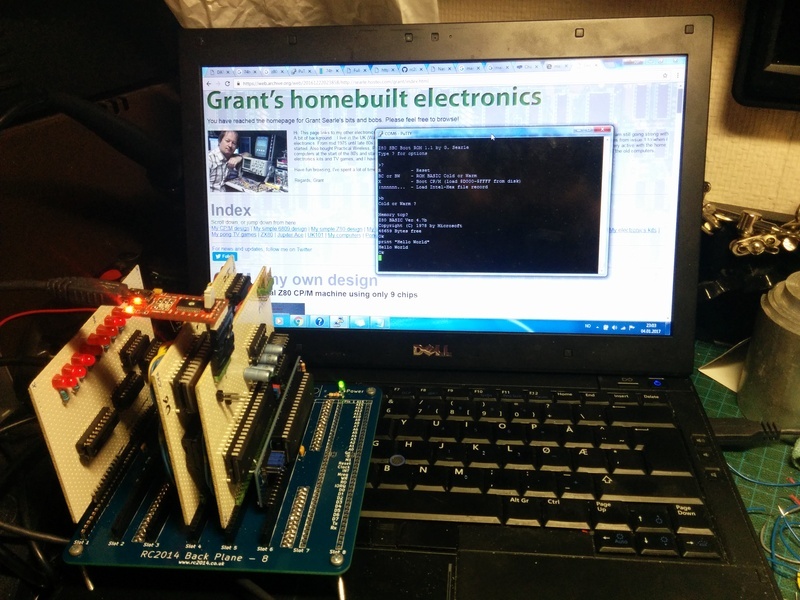 In the picture below, you can see this prototype connecting my Revision A computer to an 8-slot RC2014 backplane (not shown is that it works, and runs RC2014 ROM software off the backplane). Because this is a trivial adapter, it was a simple design. I tried to compress it without making it DIY-unfriendly. As part of the design, I added pads allowing selection of horizontal or vertical mounting of the RC2014-side of things. On the Z50Bus side of things, I decided to use on-edge mounting of the header simply because I like that style. I made a mistake in the design of this one. It's not a problem for most add-on cards, but it caused me problems when I tried to test the adapter. 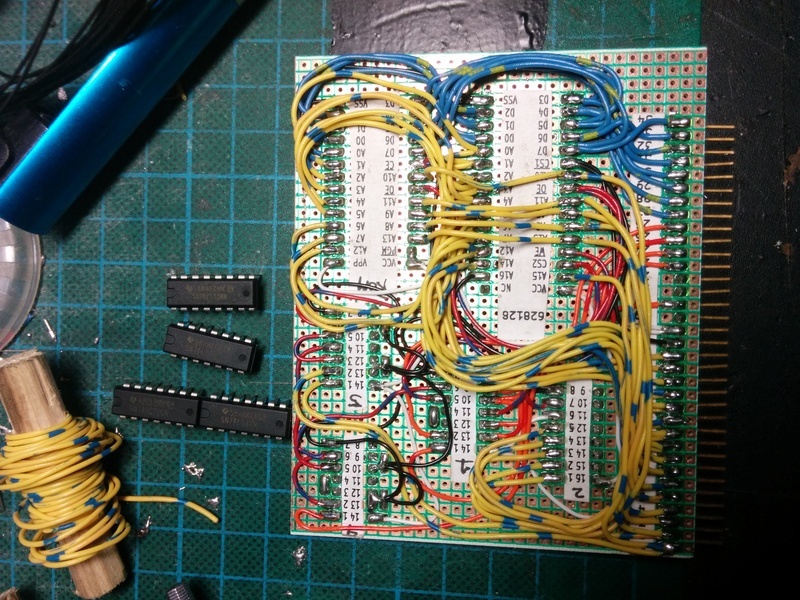 My mistake was to wire ALL signals for the simple RC2014 bus straight to the Z50Bus. Including the RX and TX lines. When I tried testing the MC68B50 serial card on the adapter, my system would seemingly not boot. I struggled for a while trying to figure that out, until I realized... The MC68B50 UART and the SIO/2 DUART were both connected to those lines. And both were trying to drive the lines! So my system was booting, but my terminal could not see that, and could not talk to the UART either. By cutting the two traces for RX and TX respectively, I had no problems with any of the modules I had to test. Even running a «Full monty» RC2014 on the RC2014 backplane, using the LiNC80 as just CPU and RAM worked without any issues. I may do an update of this board, with jumpers or solder-pads on those two lines, but as long as the user is aware that adding multiple UART chips on the same lines cause problems, I think the current version will work fine. This post is part of a series documenting my journey in making my own homebrew computer, the posts can be found on this link. In addition to that list, I set a limitation of component selection, all active components had to be currently active parts available as new from manufacturer. I also wanted to use static RAM, and have 64KByte of it in DIP packages, so the design uses two 32kx8 SRAM ICs. I'm really not much of a software-guy. I can program, and I know my way around assembler code, but I am most definitely not one of those guys that can code a ROM Monitor in an evening. Being able to re-use existing software helps me get my system up and running. The fact that Grants software works well, on a system that can run an operating system I want to use, means it would be silly of me to not take advantage of that. Because that existing software uses IM2, I would have to use IM2 as well, or commit to some serious software redesign. Besides, I wanted to try out IM2 more because I think it's cool. My desire to run CP/M also dictates the need to have a way to disable (or move) ROM out from address $0000 of the memory-map. The "dependency effect" of using existing code also makes itself visible in hardware I/O address selection. To avoid changing too much code, it makes sense for me to place the SIO/2, ROM-disable and CF-disk I/O addresses on the same addresses used in Grant's design. I also liked his approach of using a 74LS138 for decoding, so I stuck with that approach, and selected "remaining" decode outputs for use with the CTC and PIO. The decoding logic ends up "eating up" 8 I/O addresses for each "on-board device", so 40 I/O addresses in the ranges 0x00 to 0x1F and 0x38 to 0x3F are locked. Somewhat expensive in terms of resources, but it allows for a simple construction with few parts. Besides, all addresses from 0x40 and up to 0xFF are still available for expansions. As listed, I wanted to be able to use software-controllable bit/baud rates on the serial ports. 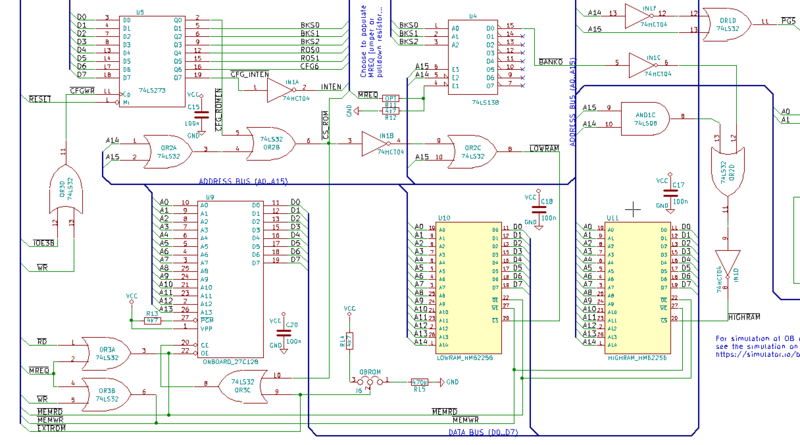 To be able to do that I chose to include the Z80CTC, a counter/timer controller, to drive the SIO. But I wasn't quite sure about my Z80 assembly skills yet, so I decided to include a jumper-selector to select SIO-clock to be CPU clock or CTC. That way, I could select CPU-clock for booting unmodified code from Grant, and then switch to CTC-clock once I knew how to do that. My first major divergence from the base design came as a result of my desire to have a memory map designed for graphics. Being able to combine that with the option of running code other people has made for Grant's design, meant that I had to include some kind of bank-switching. The design already included a very basic form of bank-switching: Grant has designed the "disable ROM" feature as a simple RS-latch that bank-switches the lower 16k between ROM and RAM. To switch from the ROM bank to the RAM bank, a write to address 0x38 needs to be done. In his design, the bank switch is triggered by an I/O write to the correct address, and the data is not used for anything. I examined the source code and found out that even if you only need to write something to the address, his code actually writes the value 0x01. Based on that, I decided that my "memory management" for bank-switching could be done using some kind of register, placed at 0x38, as long as the lowest bit of the register was used for enabling/disabling ROM. This would additionally give me the option of switching ROM back in, in contrast to Grants design where only a system reset would bring ROM back into active memory. Armed with a general idea on how I could do bank-switching, I started looking at how I could make a memory map that worked with both CP/M and graphics. Because CP/M needs to have its BIOS and BDOS placed in a predictable, always available location in memory, and it expects RAM in the bottom of memory, my options were a bit limited. On top of that, I wanted to at least start with existing software, and the software I had available expected to be able to stuff BDOS, BIOS, ISRs and stack in the top 8-16k of memory. That made me decide to use a fairly odd and uncommon memory map. I decided that the second-top-most 16k would be the "window" for bank-switching. 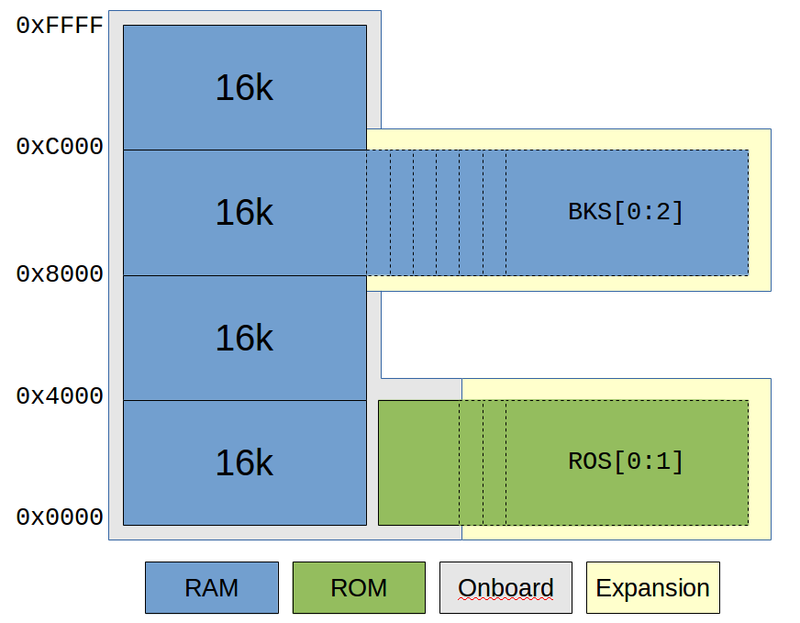 Basically, bottom 16k is switchable RAM/ROM, second 16k is always on-board RAM, third 16k is switchable memory defaulting to on-board RAM, and fourth and final 16k is always on-board RAM. With the general memory map laid out, I turned my attention back to that register I talked about earlier. I decided I'd go for the simplest approach I could think of, one that I had used to implement a simple digital-out solution for the RC2014 computer. 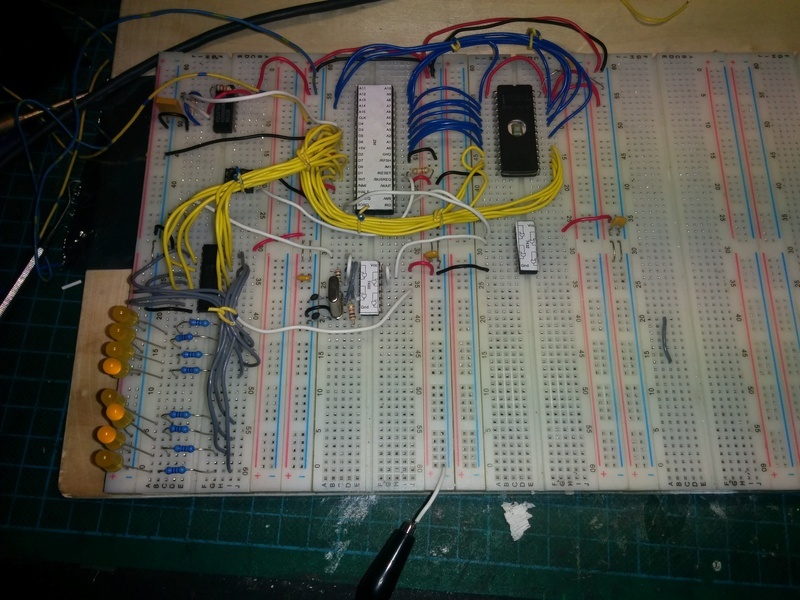 By using a 74LS273, I could get a very simple 8-bit write-only register. To quote the data sheet: «The SN54/74LS273 is a high-speed 8-Bit Register. The register consists of eight D-Type Flip-Flops with a Common Clock and an asynchronous active LOW Master Reset.». Placing one of those on I/O address 0x38, using IO Write as clock input and the data bus as D-inputs, I could use the outputs to perform bank switch selection. Using the system RESET signal for the '273s Master Reset, the system would always reset to a predictable state. And by using the lowest bit to control ROM disabling, I had compatibility with the existing code from Grant! With seven bits still available, I decided to use three bits for RAM bank select. This would let me simply use another LS138 to select one of eight RAM banks, and by using "location 000" for the on-board RAM, things should boot nicely. I selected to use one bit of the "register" to control Interrupt Enable Input of onboard devices. This would let me "lock" interrupts to an IM2 disabled state, a feature I thought would be handy to have on top of the Interrupt Enable / Disable Interrupt instructions of the CPU. This left me with a few bits left over. In my scribbling, the idea of having a ROM cartridge for fun and experimentation had been added. I quickly added to that idea, by using two of the bits as "off-board ROM bank selects". That would allow a ROM cartridge to have four 16k banks! Which by the way matches nicely with a standard 64Kbyte ROM chip size. With memory map idea fleshed out, I had to figure out a way to make the memory decode and interfacing work. I ended up finding a cool tool at https://simulator.io/ that allows for on-line simulation of digital logic. Using first a set of logic tables, I assembled an idea, and implemented it on simulator.io first, before adding it to my design. You can see and play with the result at https://simulator.io/board/RoLQ8QDEei/2. Confident that I had a memory layout that could work, and a decode logic that seemed to make sense, I started the actual design. The resulting memory interfacing logic took quite a bit more glue logic than Grants simple design, but I think it came out quite nice. The overall schematic I had in KiCAD was at this point starting to get large and complex. Thinking back at my issues with flaky breadboards, I was starting to dread building something as complex as this on either wonky breadboards, or on a very large perf-board. It would be doable, but the thought of debugging soldered point-to-point or bad breadboard connectors didn't really sound tempting. At the same time, I was still learning to use KiCAD for a somewhat large design, and I more or less accidentally started laying out a PCB. Combining manual parts layout, a bit of manual routing and experimentation with freerouting, I suddenly had a board layout that looked decent. So I took a gamble, and simply sent off some money and a few gerber files to seeed studio. Not a full week later, I received a box containing five fine looking PCBs. This board was designed with all the bullet points from the design list. There's SIO/2, CTC and PIO devices, an IDE connector, and on the right side, a Z50Bus expansion bus. Additionally, I created a different version of an expansion connector on the left side that included all the decoded bank-switching lines (but not all CPU-signals, to keep it on a 50-pin connector). Seeing how nice my PCB looked, I got to work assembling it. I soldered in passives, added sockets for IC's, and completed all soldering. After some experience with how much rosin flux can affect a complex logic circuit, I cleaned the board thoroughly before adding any of the semiconductor components. Finally, I hooked up serial ports and applied power. Or, well, something happened. The board started drawing current, and it was well within expected range. So it would seem that the reason for it not working wasn't a dead short or a major defect. It had to be some kind of logic design flaw. 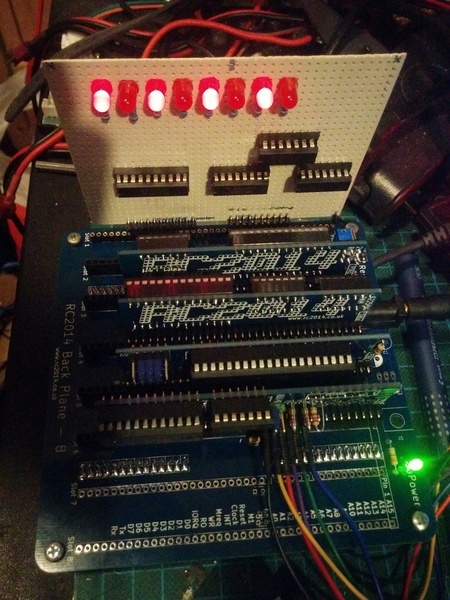 I got a hold of a cheap logic analyzer to try to figure out what was wrong, but I couldn't get the analyzer to trig properly on the T1-T3 multi-clock-per-instruction that the Z80 has. I shelved the project in frustration for a while. After some months of not working on it, I brought it back out, and started poking around. After seeing some weird behavior, and a bit of "almost working" if I removed both the 'LS138 and the 'LS273, I figured something was weird with the I/O addressing. On examining the schematic in detail, I realized I had made two really silly mistakes. The I/O address decoder was always active, doing its decoding even on Memory operations and even on the built-in DRAM refresh. Next, the 'LS273 that I was using as my "configuration register" only used the I/O address decode signal as its "Write" signal! These two problems together meant that the contents of the "register" was constantly changing. I'm not surprised that the code in ROM was less than happy about getting bank-switched out half-way through an instruction... Fortunately, I had spare logic elements in the glue logic IC's. This allowed me to fix the problems using bodge-wires and cut traces on the back of the PCB. The same evening I discovered my errors the system started doing what I had intended, and I had working CP/M on my slick-looking homebrew PCB. I decided it would be best to fix the mistakes in my schematic, so I went back to KiCAD and implemented the changes that I had made on the board. I swapped some gate selection around to make the glue logic easier to route. While I was looking at the routing issues, I had a long think about the whole "two expansion ports, one for system and one for graphics". In the end, I decided it did not really make sense. I could put all the memory/bankswitch and graphics-only signals on a much smaller header connector, and use a cable to a standard Z50Bus expansion card. That would mean only one expansion connector would be needed. This in turn would lead to much simpler routing of the board, and the board could be physically smaller, reducing cost. Reducing cost may sound weird. After all, this is my homebrew design, and I already had a working computer in front of me. But at this point, I was seriously considering making this a kit. And if I was to sell any of these, making the cost of the PCB go down would be a good plan. So, the changes were implemented, I did a new layout, and sent it off to seeed for fabrication. 10 days later I got a new batch of boards that I fairly quickly assembled. I transplanted all ICs from the previous build over, and tested it. And it did not work. ARGH! 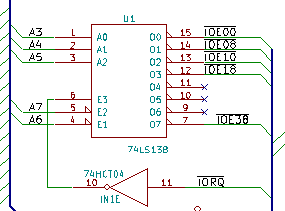 Back to the schematic, I found ONE silly mistake. 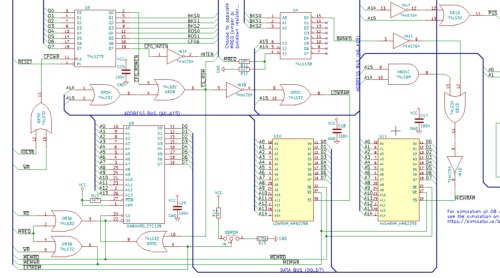 While I was redesigning, I had done some changes to the schematic around the SIO/2 chip, and while doing that, I had swapped the address lines A0 and A1 by accident. That meant that the Control and Data addresses had become swapped. A quick cut-and-solder on the PCB swapped those back, and the computer came to life! I set to work writing code to test the other on-board devices that aren't on Grants design. I got the CTC to clock and generate interrupts, and I got the PIO to work as Byte-out, Byte-in, and bit-in-out. But no matter what I did, I could not get the PIO to generate interrupts. It turns out, the PIO interrupt signal is gated by its M1 input. And, because the PIO actually has one pin less than it needs, Zilog chose to make a multiplexed M1+Reset function on the M1 pin. And in my design, I had thought "M1 input is active if either CPU M1 is active OR if system Reset is active". So I had put an OR gate there. There's one problem with this. Both Reset and M1 are ACTIVE LOW signals. And to make an "or" function for active low signals, you need to use an "and" gate! Long live boolean logic and active low signals. Who would have thought OR to be different from AND in boolean logic... I managed to finagle this by more bodging, and eventually I had a fully working computer, where all on-board devices worked. Considering the amount of self-inflicted troubles I had experienced so far, I decided to test the expansion bus and the ROM cartridge connections before fixing my schematic again. To my relief, both of those worked without problems. 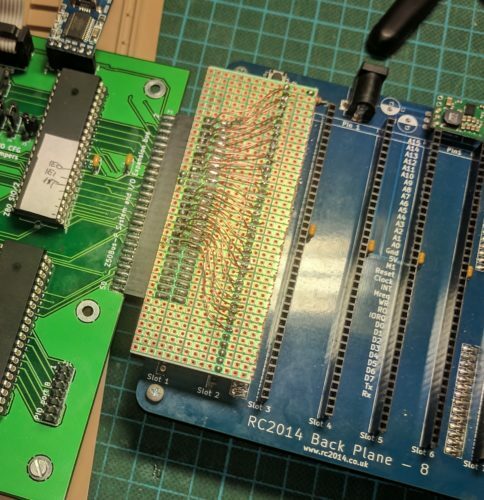 I was able to use a ROM cartridge with ROM bank select, and was even able to use the RC2014 backplane to test using off-board memory and off-board devices. 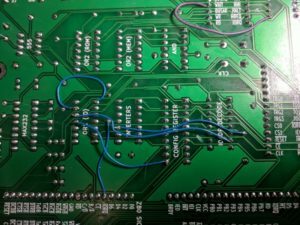 During the testing of the ROM cartridge solution, I discovered that the rule of only using parts still in production had been violated on my design. I had based the on-board ROM circuit on a 16Kx8 EPROM, the 27c128. That ROM chip is not available, and neither is it's EEPROM-version, the 28c128. Fortunately for me, the bigger AT28C256 is still in production, and very close to pin compatible. 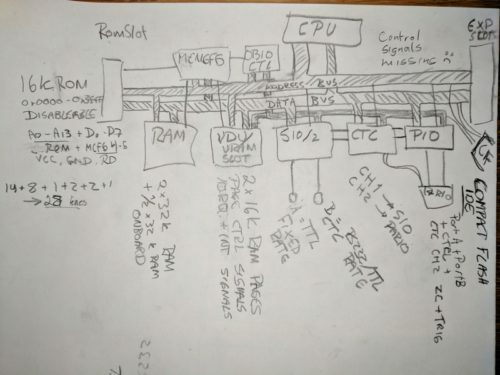 I revised the schematic and board to include two jumpers for on-board ROM allowing either tied VCC signal for 'c128-devices, or use of the ROM-select lines. This makes it possible to select between 'c128, 'c256 and 'c512 ROM chips (16k, 32k and 64k), and even use of bank switching for on-board ROM. The physical placement of the jumpers was done so a ZIF-socket would fit (it's tight, but it fits), just because I could. Considering the errors in this revision B of the board, I made corrections, and created revision C. This board now carries my official name for my homebrew computer design as it stands today: the LiNC80 Single Board Computer 1 Rev C. Considering it is an expandable board, with no on-board graphics, it may seem strange that I call it an SBC. Before the arrival of a heap of BeagleBoard and Raspberry Pi like devices, it was usual to call a PCB that implemented a fully working embeddable computer an SBC, and it was unusual for SBCs to have local graphics, but not unusual for them to have expansion/interface connectors. Revision C of the board still has a minor issue, but none that makes a real difference to a system user that is aware of it. The only significant problem I see at the moment, is related to how the two serial ports behave on RTS/CTS signals if one of the ports is left unconnected. On the board, there is a jumper that selects between honoring incoming CTS (RTS from other host), or tying it to Gnd. If unconnected and not tied to Gnd, the SIOA tends to lock up the second serial port SIOB. On the other hand, if SIOA is connected, but SIOB is left unconnected, random characters may get generated if the CTS input is floating. The solution is to jumper the unused CTS signal to "disabled" for an unconnected SIO port. 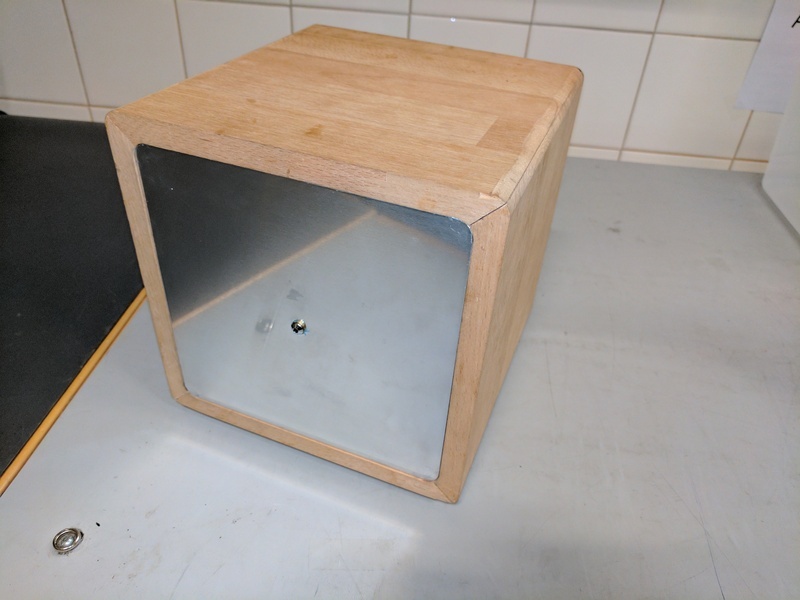 This post is part of a series documenting my journey in making my own homebrew computer, the posts can be found on this link. Stay tuned for more posts in this series. The next will probably be about the various adapter cards I have planned/made. Note! I am gearing toward making kits available! The Z50Bus is a suggestion for a system expansion bus for 8-bit microcomputers. First, a little background. It came into existence early in my design phase of my own homebrew computer. As such it is a new bus layout, and my personal needs is reflected in its layout. I wanted an expandable system, I wanted it to have a documented bus layout to allow others to design around it, the bus should be electrically simple, and require few logical components to implement. To satisfy the criteria of being simple and require few components, the layout needed to be close to the CPU I intended to use. As a result of that, the bus is closely tied to the CPU signals of the Zilog Z80 CPU. I investigated using an existing bus layout. The standardized bus layouts that I found to be relevant were S100 and STD80 or the 56-pin variant of the STD bus, as used by the Ferguson Big Board II shown at the bottom of this post. In my opinion, using any of these would require more complexity than I wanted. Following the actual standards would also be required, which would require the use of 100-, 80- or 56-pin edge connectors, and including voltage levels that seem weird in modern systems. Most of +8V, +16V and -16V, +12V and -12V would need to be included. I also looked to the popular homebrew kit system RC2014. Its bus layout is very simple, and with a SIL-like connector, it's very easy to make prototypes for the system. What I don't like about the bus, is that the standard version does not implement all useful CPU signals, and the physical rigidity of the connectors is weak. So, I wanted to use a pin-header based connection that is more rigid than a single row, and at the same time let the width of the physical connection be fairly small. The name of the Z50Bus comes from being originally designed to use a 50-pin connector to integrate a system around a Z80 CPU. Being a simple bus specification, it is possible to use/integrate it with other 8-bit CPUs using some glue logic. One such example is shown later, for using a 65C02 CPU. Signal levels are 5V Single Ended, with HC TTL levels expected. So, each signal uses a single line, and an active high signal will have a High at 3.5V - 5V, and a Low state at 0-1V. The 5V and GND lines are the only supply voltages on the bus. System implementations should make sure these are noise-free, well decoupled, and dimensioned for the system current draw. * Note that IEO/IEI forms an Interrupt Enable Chain, where the IEO of a higher priority card needs to connect to a lower priority card. This means a bus board needs to connect IEO of one "slot" to the IEI of the next. It also means cards need to be present "in order", or empty slots need IEI/IEO jumpered for interrupts to work. 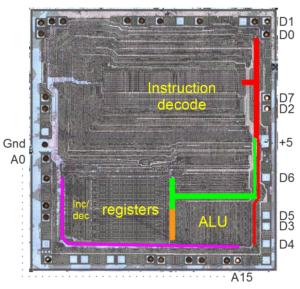 This layout of the signals is relatively simple to lay out for both CPU and expansion cards. Additionally, it is easily "unfolded" onto a single-row implementation, where using the first 42 pins mapped onto a 1x40 connector gives full compatibility with the bus layout of the RC2014 compatible ecosystem. Interrupt, Active Low, CPU Input, device requests interrupt by pulling INT low. Non Maskable Interrupt, Active Low, CPU Input, device requests interrupt by pulling INT low. Interrupt Enable Out, Active High output from one expansion card to next expansion. The signal layout for Z50Bus is simplistic, and makes very little attempt at being a signal balanced and noise cancelling bus design. The bus specification itself does not indicate if a system should use buffered bus or buffered expansions (or be raw CPU signals). The standard bus connector to be used, is 50-pin dual-row header pin and socket, with 2.54mm pin pitch. 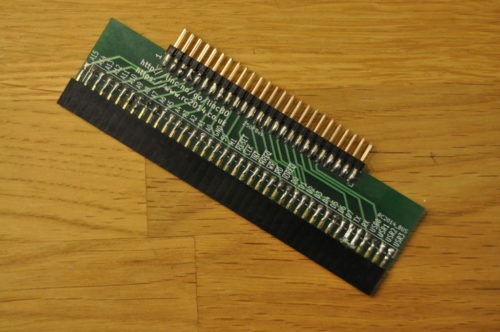 For expansion cards that plug into a busboard, a Male pin header with nominal 6mm pin length should be used ("standard" header, sometimes called 11mm). The bus-side connector should be a Female PCB Header Socket, with nominal 8.5mm height. The suggested arrangement for expansion cards is to use a Right angled connector. For orientation, an expansion card laid out so the connector is on the right hand side should have pins 1 and 2 as the top pair, 49 & 50 the bottom, and the connector on the component side. Mechanical layout is not strictly bound by the bus layout and design, but to allow for card supports, the following suggestions apply. On an expansion card, the center pair of pins (and thus the center of the connector) should be located 50mm from the edge closest to the connector pins 1 & 2. The card should leave space for a support raiser going 2.5mm in from the edge closest to pins 1 & 2, extending 20mm along that edge. For connectors used to connect a system board and expansion or bus-board, the suggested arrangement is to use straight connectors placed on-edge, female connector on the system board (main bus) side, and male on the expansion (exp bus) side. This allows the main-bus card and the exp-bus card to lie in the same plane, without requiring expensive right-angle 2x25 socket headers. Being a bus for 8-bit microcomputers designed after 2016, the number of potential CPU's relevant for new designs is limited. Currently only the Z80-family and the 65x02 family of CPU's have parts still in production. Because of this, only a 65x02 adaption of the bus is suggested here. Some of the Z80-style signals need to be synthesized. 65x02 uses memory mapped IO, so the IOReq signal needs to be generated by the CPU card/system when a request is made to the 65x02 IO address space selected for the system. The Mreq signal will then be a simple invert of the IOReq signal. An equivalent function of the WAIT and HALT signals may be found on the 65x02 RDY line. A diode split of the function may be appropriate. The SYNC signal can be adapted for the M1 signal function, if the INTAck feature is considered in the implementation. There exists a 65c02 CPU card for the RC2014 system, this should be seen as the reference implementation when adapted to Z50Bus layout for the basic signals. See http://ancientcomputing.blogspot.no/2017/05/a-6502-cpu-for-rc2014-part-1.html. It is suggested that 65x02 based systems using the Z50Bus indicate clearly that not all expansion cards designed for a Z80 native Z50Bus system will be compatible. This is taken from the manual at http://www.bitsavers.org/pdf/ferguson/bigBoardII_Aug82.pdf. No further information is given in the manual. With a fresh success of building a computer from a kit, I decided to implement an existing design on perfboard, instead of drawing a design of my own right-away for breadboard building. 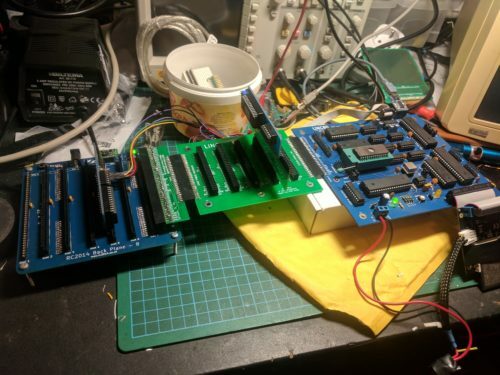 Considering that the RC2014 is closely based on the work of Grant Searle, it was natural for me to take another design of his, and adapt to the 8-slot backplane: the "fully functional CP/M machine using only 9 chips" design. I broke the design down to separate functional blocks, and built each as a separate card. By splitting the build into these distinct parts, I was able to build one card, and verify functionality of that card using the RC2014 before continuing to the next. All the cards were built on 100mm wide perfboard, using a direct soldered wire approach. I chose to make the RAM/ROM as a single combined card, because I did not want to split the ROM-disable function needed for CP/M up across two cards. It also allowed me to reduce the potential part count (by 1 IC). 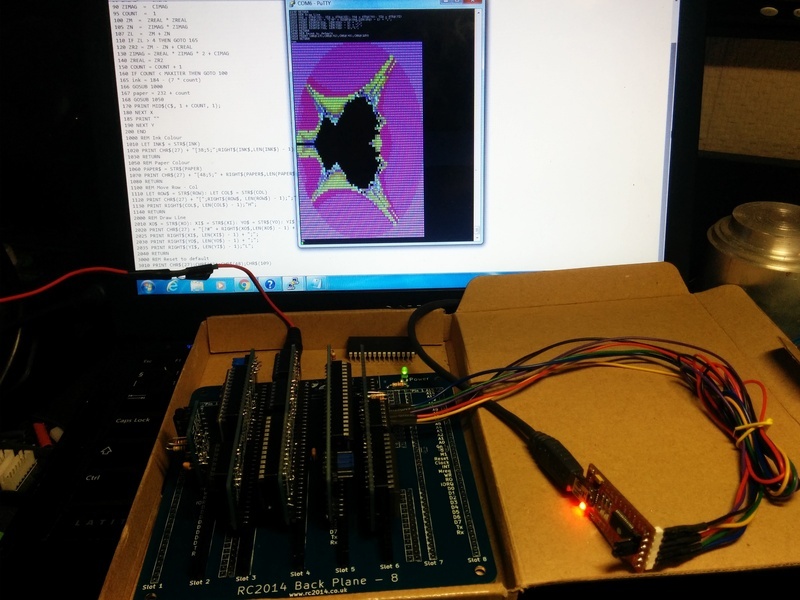 Because of the close relationship between the RC2014 design and the one I was implementing, I could simply use the ROM content from the RC2014 for verifying the ROM/RAM using the CPU and Serial I/O board from the kit. Grant's CP/M design uses a different UART from the BASIC design. The BASIC design uses a 65B50, while the CP/M design uses a SIO/2. So this was the next card to be built. To verify this one, I burned a new ROM containing the "monitor" for the complete CP/M-design. This monitor also includes an 8k BASIC version, so it was easy to verify the SIO/2 board without having a CF-storage approach available. The original breadboard design page talks a bit about how to wire up a Compact Flash card, and how to hand-solder the SMD connector used for CF-cards. I did really not want to deal with that connector directly, and gambled on being able to use an IDE-to-CF adapter, considering the design really uses CF in 8-bit IDE mode anyway. My "IDE adapter" is basically a couple of OR-gates, an '138 address decoder, some resistors and a 40-pin male header connector. And it worked! With a short IDE cable between my "adapter" and a commercial IDECF-adapter, I was able to prep the CF card, load software onto it, and boot to a lovely "A>" prompt! I could have rested here, but decided to whip up a new CPU board, as that, plus the clock generator, now was the only cards from the RC2014 kit that was in use. I integrated the clock, and also added an auto-reset onto the CPU card. 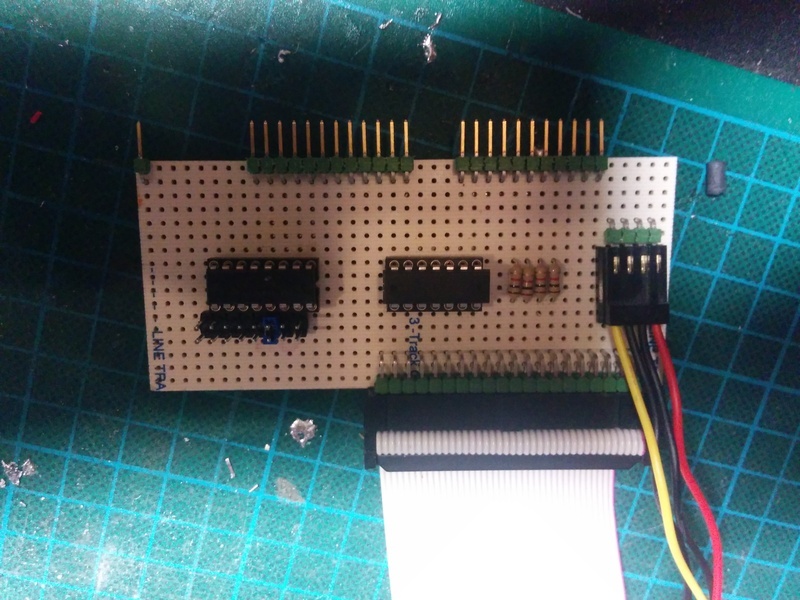 The final card I built for the RC2014 bus, was a YM2149F synthesizer sound chip adapter. It required some fairly weird address decoding logic, so I spent quite a while on the design of this relatively simple card. After laying it out on perfboard and soldering up the wiring, I had a working sound card. I do believe I am starting to get a hang of this... What I still don't have as good a hang of, is large-scale assembly projects. So, I have tested the YM-card extensively from BASIC, and I have some general test-routines for it written in Assembly. But I have not made any proper songs using it, and I am quite far from implementing a Tracker or Player of any kind. What I have used the system for, however, is getting to know how to code z80 Assembly for CP/M. It's a neat little operating system. A task as "small" as reading a file from disk has you digging quite deep into the system itself. As a result you end up with a very deep understanding of how the operating system internals work. And being such a small operating system, it is quite possible for a person to understand the entire operating system, after a reasonably short time studying it. I created a final board for the system. 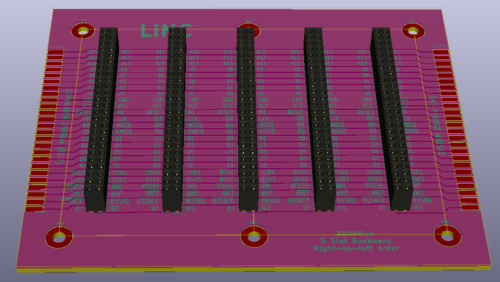 By using a very cheap Chinese strip-board, I created a barebones version of the backplane. 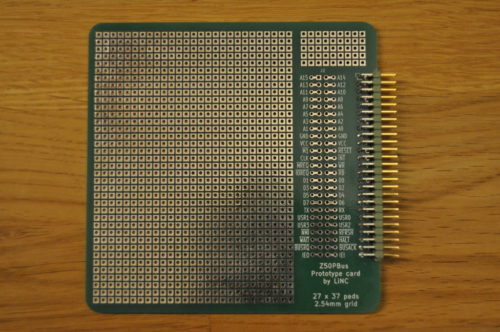 This freed up the RC2014 backplane to go back to being used with the original kit, and also made the computer a completely homebrew build. After this, the electronics part of the perfboard project was done. With such great results on the electronics side, I figured it deserved a nice place to live, and not become yet another stack of project parts in one of my bins of such. So I built a wooden cabinet for it, with some 3D printed parts to hold the cards in place. The case is made from beech wood, with an inlaid aluminium front. After having solved the mystery of counterfeit parts, I felt ready to start attacking my master plan of building my own Z80 based computer. I wired up a CPU test circuit and used with great success. I then wired up a simple system on a set of cheap breadboards, consisting of the CPU, a ROM chip and a slow clock generator. With LEDs on the address bus, I punched up some simple assembly that NOP'ed for a while, did a JMP, NOP'ed some more, and then JMP'ed back to start. This was assembled using TASM under Dosbox, and loaded into the ROM using my Minipro programmer. When I applied power to the circuit, it started ticking along, and did just what I expected it to do! Success! With great spirit, I next wired up a far more "complex" circuit. I added a few support logic gates, a 74LS138 4-to-8 decoder and a 74LS373 8-bit latch, and moved the LEDs from the address bus to the outputs of the latch. With the added components, I had a kind-of 8-bit digital output. With a simple counter code typed and assembled, I had partial success. The circuit and code worked. And then sometimes it didn't. And sometimes when it didn't work, it would start working after some time. Breadboarded system with "Output port"
With the bad experiences from fake chips, I started suspecting that my cheap breadboards were causing problems. So I moved the circuit over to one of my "known good" breadboards, part of an old digital trainer device. Now the circuit and code worked most of the time, but still sometimes not. I was getting frustrated. I tore down my wiring, checked and verified my circuit, wired it back up, and got the same result. Was there something that I had completely misunderstood? Was there something very wrong with my method? Eventually, I decided to stop faffing about. I decided that the best way forward, would be to start building a known good design. With that, I would be able to verify that I am able to pull this off, and I would be able to use it to test and verify what I was designing from scratch. 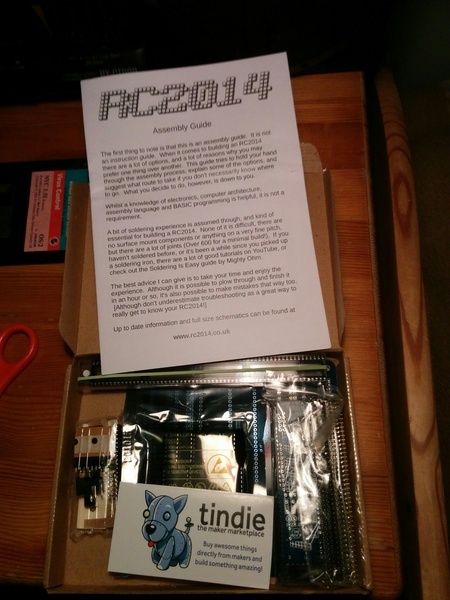 So, enter the RC2014! It was now late december 2015, perfect timing for a "christmas gift to self" kind of a purchase. In my research for options and ideas, I had looked at Spencer Owen's RC2014 several times. It is a dead simple design, and cheap as well. Perfect match. Off to Tindie I went, my order placed on saturday the 19. december. I was very impressed when the kit arrived in my mailbox on the 23rd! I brought the kit with my on my Christmas holiday, and by the 27th it was completed. I connected up a TTL-USB adapter, and powered the thing up. To much joy, the kit sprung to life! 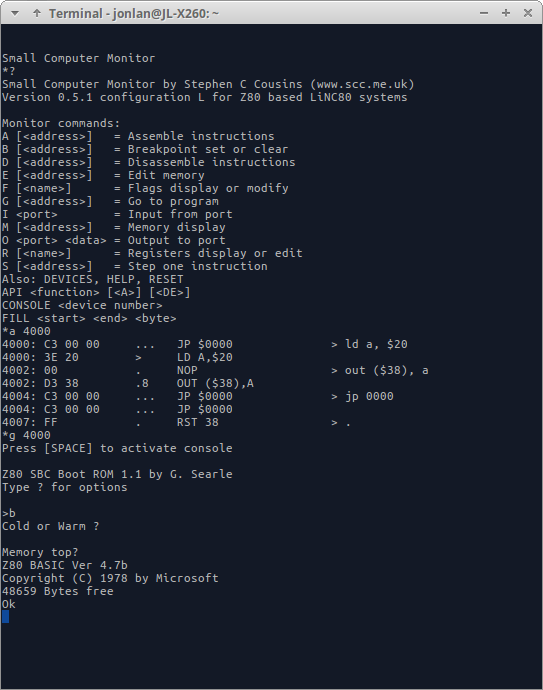 Grant Searle's BASIC monitor greeted me with Microsoft BASIC for Nascom (modified by Searle and Owen). 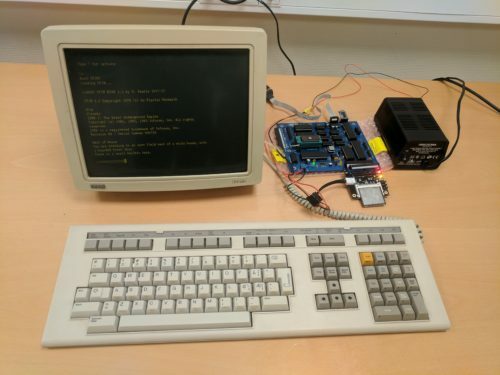 I now had my first working Z80 based homebrew computer! And with an 8-slot backplane, I had 3 slots available, as the original kit uses 5 slots: CPU, ROM, RAM, Serial I/O and Clock generator. 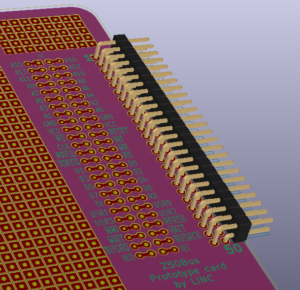 With a simple bus format using Single row connectors, it should be easy to make expansion cards. I dug out a perf-board, added the needed right-angle single-row header pins, and soldered up the exact circuit I had tried on my breadboard. I plugged it into the backplane, and tested it using OUT statements in BASIC. It worked! Another great success, but at the same time somewhat of a mystery to me. Why did it not work on breadboard, when it worked fine in a more complex system? I decided to test removing the RAM and Serial cards, and load my test-ROM onto the ROM card. Suddenly, the I/O board was behaving erratically again. Thanks to RC2014, I now had proof that my hardware was working, and my software was bad. The kit had actually already accomplished what I wanted: verify that I could assemble a working system from someone else's design, and verify that I could design working hardware myself. All of this made me make a change of plans. Instead of going back to the breadboard, I decided to try to implement Grant Searle's Minimal CP/M system using home-built cards for the RC2014 backplane, before proceeding with my own design. The process of this is the topic of a post of it's own. 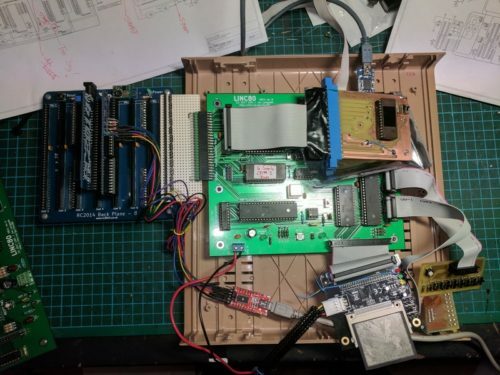 This adventure started with a plan, and a bit of drafted design, to make a homebrew computer based on a Z80 CPU, and related components. But, I didn't actually have a Z80 chip yet! So, being cheap, I got the idea that going to eBay to find the needed components would be a great idea. Boy was I wrong. 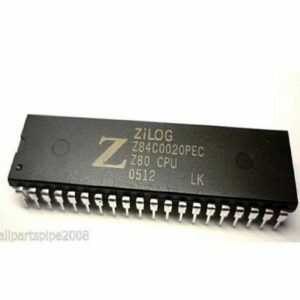 After looking over my ideas, I searched eBay, and came up with a list of orders for central parts: A pair of Z80C0020 CPUs for $3.35, a Z84C4208 SIO/2 for $7.90, and five HM628128LP RAM chips for $6.0. All items from sellers providing free international shipping! The money left my account in december of '15. As with all orders that include free international shipping, delivery time was a few weeks, so the project was put on a back-burner. When the parts arrived in early february, I was already well into other projects. So I gave them a quick look, everything seemed in order, and I packed them in my parts bin to wait. For nearly a full year. When winter came around in 2016 and Christmas was approaching, it was time to start a winter-project. 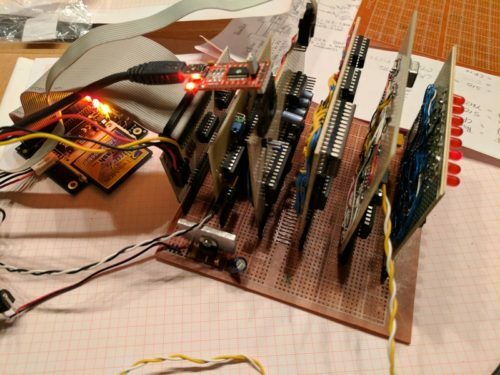 The Z80 homebrew project was resurrected, the components were dug out from the parts bin, and the first test-circuit was wired up on a set of breadboards purchased at bottom-price sometime during summer. A test-setup for this CPU is extremely simple. 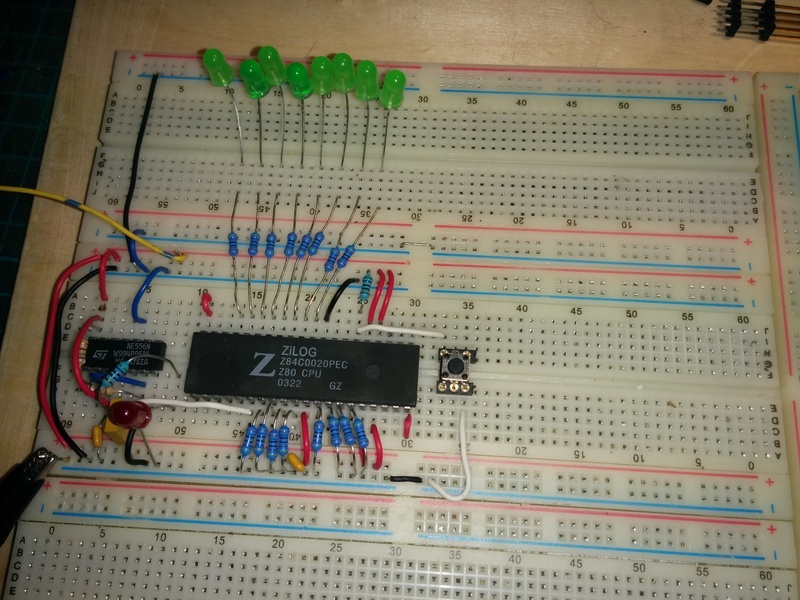 In the Z80/8080 instruction sets, the opcode 0x00, 0b00000000 is a NOP, so simply making all data-bus pins be tied to ground makes the CPU NOP its way through all 65536 addresses! So: behold the test-setup.. I checked, and checked again that I had the pinouts and connections right, made sure my bench power-supply was set to 4.99Volts, and examined my documentation to see that I should expect about 5-30mA current, LEDs not included. Next I connected my VCC from the power-supply to the setup, and immediately ripped the wired back off. The powersupply screamed 800mA at me! What could be causing my simple test circuit to draw 10-20 times as much current than I expected? My first suspect was of course my wiring. So I checked that again. Pin-for-pin it was correct. The second suspect was the cheap breadboards, and the doublesided tape that stuck them to a wooden board. To eliminate those, I moved the circuit to a "known good" set of breadboards, part of an electronics trainer. After again checking the wiring, power was applied, and again the circuit pulled 6-800mA, and none of the LEDs lit up. As I now didn't have a CPU to use in the project, I decided to look up what the Z80 would cost from the reputable sources. After seeing that Mouser, DigiKey and RS Online all had the Z84C0010PEG in stock, I selected to order two from DigiKey for a total of $12, plus just about $18 for shipping. So, close to 10 times more than I paid for the two duds from eBay. But unlike the first two that took around 25 days to arrive and were non-functional, DigiKey had the parts in my mailbox some 50 hours after ordering, transported from the UK to Norway. And when I inserted one of them in the test circuit, it worked flawlessly, and pulled just under 28mA. With a sneaking suspicion that less than $10 for the SIO/2 delivered might be a very optimistic price, I decided to test that one with only the supply voltage applied to the VCC/GND pins. I was most certainly correct. Just under an amp was being pulled, and the chip got very hot indeed (but did not release any magical smoke). Was I surprised? Well, the first time, with the CPU I was, even if the price had been very low indeed. But when the SIO/2 turned out to be a dud as well, I was not surprised. The cheapskate in me had received a lesson: Always buy active semiconductor components from a proper, reputable source! There's two types of semiconductor fakery going on: Clones of actual components, and outright fake duds. In the first group, you have things like the FTDI232/PL2303 fakes, where functional (but possibly crippled) semiconductor copies or clones are being manufactured and sold, as being the real deal. Some of these clones actually make their way into the mainstream supply chain of the official parts, sometimes because the original manufacturer "moonlights" poor-quality cheaper editions of the original. The second type relies on online trade, cheapskates like me, or naive buyers. In this group, a seller looking to make a quick buck targets one or more reasonably popular but usually somewhat obscure components. They gets a hold of a bunch of very cheap components in the same package (like the DIP40 of a Z80). The cheap component will typically be a random IC that sells very cheaply, factory defects that can be picked from scrap heaps, or even old parts pulled from "recycling". With the package, they then clear away any markings on the package, and silk-print the markings of their "target". This convincing lookalike is then put up for sale, usually with a price placed around 1/2 of the "per one" price of sellers like DigiKey or Mouser. So, how does one spot the fake? Most of the time, simply looking at the price including shipping should be enough. If a component costs $6 plus shipping from Mouser, and sells for $2 including free international shipping, just walk away. It's going to be a fake. Also, if a seller is using the same stock, but not manufacturer, photo of the component as every other seller with the same device at the same price you're probably in muddy waters. Unfortunately it's not always that simple. Often times, the price is probable, and the photo looks convincing. And when you get the component in hand, the relabeling has been so well done you don't spot it. It really is a buyer beware situation. Considering that a "realistic price" is typically the same as the price for a new component (or even higher) bought from DigiKey or Mouser, when would these "rules" for eBay-ing semiconductors apply? The answer to this is very simple: Non-active, obsolete parts. Sometimes you need an old part that's no longer in production. Trying to find a "good" seller of these is sometimes impossible, and if possible they are usually priced waaay expensive. So the best option for getting a decent price is going to eBay. One example of mine of this is the AY-3-8910/YM2149. I have wanted to experiment with one of the "olde-time" 8-bit audio-chips, and looking over the various soundchip options I decided I wanted to try out the General Instruments AY-3-8910 or one of it's variants. Unfortunately the all of the AY-3-89xx chips, in GI or Microchip name, as well as the YM2149F have been out of production for several years. The only option of getting a hold of one is to get NOS or Pulled parts. I located a not-eBay seller (unfortunately I've lost the link) of genuine NOS AY-3-8912 chips. Unfortunately, paying $50 per chip was not something I felt like doing for a bit of experimentation. My limit was at $25. Going to eBay instead I located a chap in Germany that wanted $5 plus $1 shipping for one YM2149F. I also located a pair of sellers in China, one that wanted $8, free shipping for a Microchip AY-3-8910 and one that wanted $7 plus $2 shipping for an AY-3-8912. I ordered those three. When they arrived, I found out that the 8910 one was clearly a fake, while the 8912 and the 2149 both worked just fine! There are a LOT of fake semiconductors on eBay and AliExpress. Generally, cheap, free-shipping components sold on these sites from mainland China are guaranteed to be fake. If the component you are looking for is still in active production, buy it from a proper electronics distributor like RS Components, DigiKey or Mouser. If the component you are looking for is obsolete/out of production, take care, research probable prices, and be critical to sellers location. The world of computing as we know it wasn't in my opinion started by the big behemoths of the early computing age. Yes, they created the field of computing, and through steady capability increase combined with reduced sizes made the systems we have today possible. But it required the invention of the microprocessor to make the idea of personal computing a realistic idea. Before that, it seemed computers was something for big businesses, universities and research institutes. But with the creation of chips, originally designed for flight computers in jetfighters and for calculators at accountant desks, hobbyists started playing with the idea of creating a computer of their own! Early on, the homebrew computer systems was the way to get a computer in a private home. Early examples of commercial personal computers, like the Altair 8800 and Processor Technology Sol-20 were in reality business-backed homebrew systems. In fact, the first of these commercial systems were shipped as blank PCBs and bags of components. Even the famous Apple I computer is an example of this. It is this enabling of computers in the average Joe's hands that enabled the explosion of computing that has lead to the technology enabling we have today. So, to design thoughts and ideas. I wanted to create a computer that fits in the era of homebrew. This means to me, a fairly low-end system, designed by an individual or a small group of people, using time-period components, to be built in the home. If my design is able to be produced as a kit, that fits right in with the "standard" of the day. System designs were prototyped in basements and cellars, to later be sold as kits for other people to brew at home, and modify and expand. It was natural for me to select an 8-bit platform as my target, after all the 8-bit "revolution" was at the core of homebrew. As mentioned, I wanted to use time-period components, but I also wanted to be able to create my system without having to resort to "New-old-stock" or cannibalizing of parts to get a hold of parts that are no longer manufactured. This put some hefty restrictions on my options, and also meant I had to allow myself to use a few bits of "modern" technology. This brings me directly to the choice of a CPU for my system. I talked about how the 6502 was the first CPU that I got to know in-depth in my previous post. Unfortunately (or fortunately, take a pick), I early on decided that the 6502 would not be the CPU for my system. While the CPU is still available, in a CMOS-ified version with added instructions (W65C02S6TPG-14), it would require some supporting components that are no longer available (other than NOS) to make a full computer that I would be happy with. With that realization, I started looking at what other microprocessors were used in significant number of designs. Candidates seemed to be: RCA CDP1802, Motorola 6800, Intel 8088, Intel 8086 and Zilog Z80. Of those, the only one that has an active, still in production version that's not a derivation is the Z80. As a bonus for choosing that one, it comes in a bread- and perf-board friendly 40Pin DIP, and has significantly simpler interfacing than the other options, by having full address- and databuses, simple single-phase clock and a trivial voltage-supply requirement of simply 5Volt. The Z80 was also designed to be relatively compatible with the 8080, so a lot of existing software runs on both CPUs. Landing on the Z80 gave me additional things to explore. Being a retrocomputing-nerd, I have for a long time wanted a system that could run CP/M. Control Program for Microcomputers is a very significant part of Personal Computing History, and a great number of systems, both commercial and homebrew, either had CP/M ported, or were designed specifically for it. With the Altair and IMSAI computers kick-starting a form of standardization with the S100 bus, CP/M became more or less the standard operating system for general personal computers, and thus had a majority share of the system software marked. It was only beat by the multitudes of different ROM BASIC versions summed up. 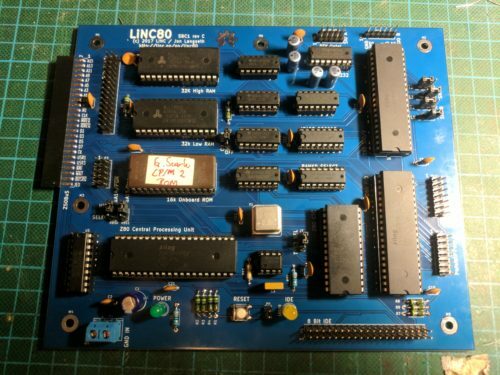 CP/M was designed for select 8-bit Intel 8080 development systems, but due to its design it was easily ported to compatible machines, and with the compatibility of the Z80, quite a lot of systems were designed with just that CPU. While exploring what it would take to let me design a CP/M friendly system, I discovered Grant Searle's brilliant set of designs. On taking in the content of his site, I was first impressed by the amount and quality of work mr Searle has done to make his systems available and understandable. Second, I was blown away by how simple a CP/M system could be. So my path was early on set; I would take inspiration from those designs, and get CP/M running! One of my early design choices was between simplicity or expandability. I had looked at the designs in the Retrobrew Computers community, and generally thought they were trying to be somewhat more "modern" than what I was trying to achieve. I wanted something that was a bit simpler, but at the same time I thought that having the option of extending the system would be great. This led to quite a few nights reading up on various bus architectures from the homebrew era, thinking about using one of the "standard" options like S100 or STD80. One big issue with using one of the full-featured old standard bus designs was that it would require a lot more complexity than I wanted. So I decided not to go down that route, and rather go for a more raw CPU signal extension bus. While examining what I would need to put on such an expansion interface, I became aware of Spencer Owen's RC2014. His first version of the RC2014 was basically Grant Searle's simple Z80 BASIC system, split into multiple cards, one for each major component, connected to each other on a simple 40-pin perfboard-friendly bus-approach. I really liked the concept, but saw a few challenges in it. It used single-row 2.54mm spaced header pins, and omitted a few signals that I knew would be needed later. From experience, I felt that using double-row connectors would lead to more solid mechanical properties, as well as making the bus mechanically smaller. Spencer's bus does not "fit" on a 100mm wide PCB, a real issue as prices for PCBs (and EDA/CAD if not using KiCAD or EasyEDA) has a definite crossing point at exactly 100mm... A double-row physical layout would also very easily translate into a card-edge implementation if one would like a truly retro feel... There will be a (possibly short) article about the result, with pinout and concept released to the public domain. I call my idea/approach the Z50Bus. With a bus inspired by RC2014, it would also be possible to take advantage of the many cool designs that Scott M Baker has made. Take a look at http://www.smbaker.com/category/electronics-projects/, he has some really sleek additions and extensions based on the fairly simple RC2014. After seeing what smbaker has been able to do, I was sure that I wanted a simple, yet complete CPU bus, and that way be able to reduce the amount of "onboard" features. Originally, I really really wanted to have a graphics system as a direct part of my design. Quite a lot of time was spent thinking about using memory-mapped or register/io-space based with their pros and cons, debating using a prefab Video Display Processor like the VIC, VDP or Yamaha V-series, and researching indexed video, colour-register based approaches and planar graphics. After seeing FAP, the FPGA Assisted Processor, I came to the conclusion that using an FPGA would be very similar to the time-period correct ULA, PLA and CPLD approaches that were actually used on Home Computers of the 1979-1985 period, just faster and reconfigurable. Going that route should allow a core hardware design to implement many different graphics subsystems, allowing experimentation. However, I have chosen to not implement the actual graphics system initially! Most homebrew computers of the early microprocessor age didn't actually have graphics capabilities. Most didn't even support a keyboard. Generally the approach in the early days of homebrew computing was to use a teletype terminal, or a video display terminal. So I decided, if a set of serial ports was enough to get the homebrew computing started, a set of serial ports would be enough to get my system started as well! After all, I had already included an expansion interface, so adding graphics and keyboard I/O later on would simply be just that; an expansion. However, to be able to use memory-mapped video later, I would have to design my memory-map and RAM-interfacing with that in mind. The memory map, and the reasoning behind it is topic for a separate article. Similar to the decision design for graphics as an expansion, I decided that storage media like floppy disk support is to be an expansion. I intend to create a floppy disk interface, for an actual floppy drive and/or a Lotharek HXC. Also on the roadmap is trying to go real retro, with a cassette interface. But I changed my mind about one form of storage connection. Even if IDE appeared on the market late in the 80's, it is too embarrassingly trivial to implement the 8bit microcomputer compatible mode of IDE. 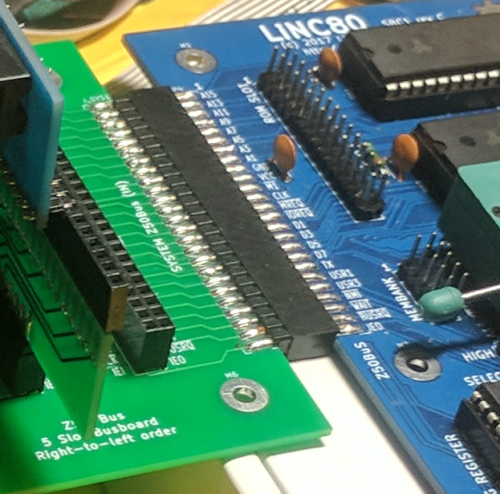 With a sane I/O interface like the Z80 has, all that is required to get working 8-bit mode IDE is a simple address selector, and two OR-gates and a few resistors. Plop a Compact Flash card adapter onto that, and you have an interface to solid state storage "for free". The fact that Grant Searle's CP/M computer uses that exact approach meant that is was an obvious choice for me to include it. 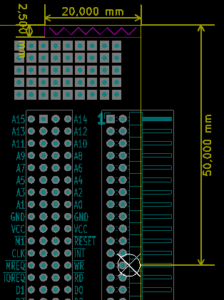 So, my basic design was centered around a Z80 CPU, with a memory map that would work with CP/M and a future graphics expansion, and serial ports for console and communication. To make it possible to have reconfigurable serial port speeds, and also general purpose timer triggered events I figured I needed to include some form of timer controller as an on-board peripheral. It would also be nice if interfacing with the "outside world" was easy, so adding one or more configurable parallel I/O ports made sense. 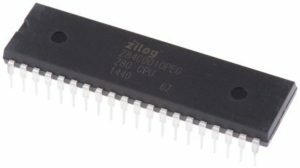 The more I looked at that spec, the more obvious it became that I was more or less describing the standard Zilog "stack" (minus the DMAC): Z80 CPU as the processor, Z80 SIO for serial ports, Z80 CTC for the timer/counters and the Z80 PIO for two parallel ports. 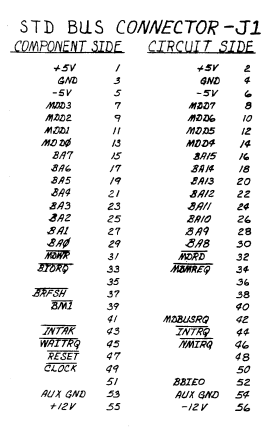 From this, it became natural to also design the system to take full advantage of the somewhat special, but cool Z80 Interrupt Mode 2. IM2 is designed with a very powerful daisy-chain form of interrupt priority and arbitration. In IM2, devices are daisy-chained using their Interrupt Enable In (IEI) and Interrupt Enable Out (IEO) pins, with priority being resolved by their order in the chain. Additionally, interrupt handling is vectored, with the CPU providing upper 8 bits and the interrupting device providing the lower 8 bits of the relevant Interrupt Service Routine to be executed. The whole IM2 system looked very nice to me, so it is a central design element. It introduces challenges when trying to use non-Zilog peripherals unfortunately, but Luke Maurits has given me some ideas to solve that later from his LM-512 Homebrew computer. As part of my process of building my "learning computers", in the forms of Grant Searle's CP/M computer and Spencer Owen's RC2014, I figured that following an approach close to those made sense. Using 74LS138 for address decoding of on-board peripherals was a safe and natural approach. To enable a memory map for CP/M plus expansion for graphics, I decided to add a "write-only configuration register" by including a 74LS273, placed at the IO address that Grant's monitor ROM uses to enable/disable onboard ROM. I decided that I did not want the complexity of catering for a large memory space, onboard memory was set to 64kbyte onboard RAM, 16k onboard ROM, with a bit of banking for a max configuration of 176k ( 16k*8+48k) RAM and 64k (16k*4) ROM in an expanded system using memory banking via the configuration register. This configuration would allow use of CP/M, expansion with graphics and storage later, but it restricts the system to not be compatible with Fuzix by Alan Cox et al. The last point in the list turned out to be very useful, as it allowed me to tackle a bunch of problems I encountered, without having to also write my own system ROM monitor. 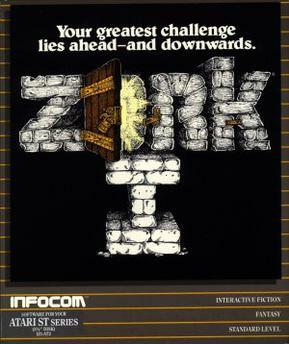 It also let me simply load up CP/M onto a CF card and start playing Zork!